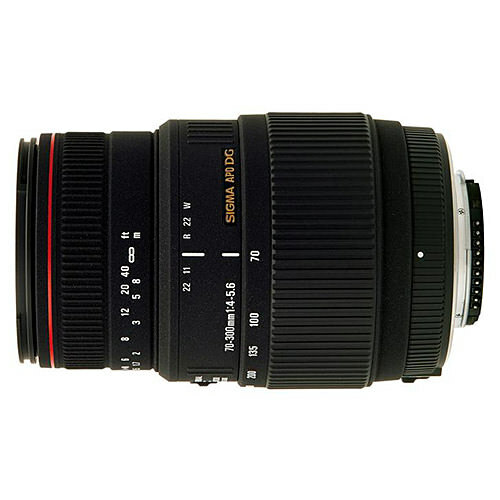 Lens Description: The Sigma APO 70-300mm f/4-5.6 DG Macro Lens for Canon Digital SLR Cameras is a telephoto zoom lens with tele-macro functionality. Optimized for digital cameras, this high-performance lens has two Special Low Dispersion (SLD) glass elements in the front lens group and one in the rear lens group. It is able to shoot with maximum magnification 1:2 at the focal length of 300 millimeters. It\'s the ideal lens for portraits, sports photography, nature photography, and other types of photography that frequently use the telephoto range. I’ve used, as an amateur (I’m not a professional), the Sony Alpha mount version of this lens on a KM Dynax 5D and on a Sony A700 (where I still use it). The lens is lightweight and affordable yet the build quality is quite reasonable (for the price). The mount is metallic and the lens does not wobble much even when fully extended. A round hood is included with the lens. As usual in this price range the lens extends when zooming and focusing and the front element rotates which is very annoying when using polarizers and dust/moisture covers over the barrel (covers must be kept very loose, partially defeating their purpose, to avoid damaging the lens focus mechanism). A zoom lock would be welcome; the zoom tends to creep when the lens is pointed down. Sharpness is OK from 70 to 200 mm but decreases very fast past 200 mm and is very weak at 300 mm. I think one can get better pictures using the lens at 200 mm and cropping in post than using the lens at 300 mm. The APO glass does its job well and chromatic aberration is almost non-existent across the whole focal length range. Autofocus is driven by the camera but is quite fast if using the central focus point of an A700. I’ve read some reviews where users complain of broken cams on the lens after some use but mine is still working fine (lucky me?). Manual focus is surely possible, the lens having a large focus ring with no slack, but it turns only 90 degrees and rotates a bit too freely to my taste. Macro mode is engaged with a side switch and can be used between 200 and 300 mm. One can reach a 1:2 reproduction ratio. Quite fun for a lens at this price! Even in normal mode the minimum focus distance of 1.5 m (approx. 5 ft.) is very good for an inexpensive 70-300! There is some focus breathing but I think it’s within normal values, especially at this price. Conclusion: obviously some concessions have been made in this lens design to keep the price low and I really cannot go as far as to recommend it. But for everyone with a tight budget looking for a tele zoom I think it definitely deserves to be considered as an option. This is one of the lenses I carry almost always/everywhere and I enjoy using it. When I don’t forget about the lens, camera and, specially, my own limitations I’m rewarded with some very nice pictures. There is a newer Sigma very similar to this one but with optical stabilization, it’s probably a better choice for Canon and Nikon users but, if I remember correctly, quite a bit more expensive, losing a very important advantage of this lens. One last word of caution for Sony Alpha users: older versions of this lens (at least the ones manufactured before September 2010) need to be updated by Sigma in order to work properly in (some?) SLTs (aperture control compatibility problem). Canon and Sigma mounts: not sure. They do not specify AF motor but they have a note saying “All Sigma and Canon mounts incorporate a built-in AF motor”. The information is for lenses currently shipping, older versions may have different characteristics. This one is not a review and is not for publishing, it’s just a comparison of my lens (Sony alpha mount) to your technical specifications. I think the lenses are very similar in the various available mounts but I’m not sure so please take my notes “with a grain of salt”. Again, thank you very much for your hard work and please, please, please do confirm my infos but they are correct for my lens. I’ve not checked Max./min. angle of view, number of elements and groups, number of diaphragm blades, number of aspherical elements, dimensions and weight but they all seem plausible to me. I use Nikon D5100, is this lense compatible with my cam? I want to buy this lens ASAP, and one more thing what about wildlife photography with this lens. the lens is compatible with Nikon D5100 and autofocus will work (if you buy it in Nikon F mount, of course). It is not a very good lens, though, and its optical shortcomings will be quite apparent with your camera’s 16 megapixel sensor. Refer to above comments so generously posted by Paulo Flores for a bit more information about it, if you like. Good luck! Hi, I used Sony alpha 58 camera…. can I use Sigma 70 – 300 mm F4-5.6 APO DG Macro Lens? please give me your valuable suggestion…. I am using pentax k30 and want to buy Sigma 70-300mm f/4-5.6 APO DG Macro ASAP so need an expert opinion about the mount type and the best online seller. Got this lens last year for around $150.00. Lens is a really great deal and the pictures are as good as the Nikon kit lenses but, the lens does not have OS or Nikon VR so you have to keep shutter speed up there or else yours pictures will be blurry. Also, it is not a fast lens f: 4 – 5.6 which makes it harder to get a fast shutter speed in very cloudy overcast days unless you up the iso above 1600 which causes more noise in your pictures. I have a nikon D3200 and the pictures i get on sunny days are amazing and since my sensor is cropped it a 450mm on the long end for me, a big bonus. Great clear pictures if you use a tripod or fast shutter speeds on a bright day. There are better lens out there and if you want to shoot in low light and have VR too with exceptional great pictures spend about 7 grand and get a Nikon 70 – 300 mm f:2 or something like that. a $150 lens with a 450mm zoom on the long end with crop sensor you cant go wrong. A very nice lens to take with you on holiday. It’s light and very compact. I made some wonderful pictures with it, especially on shorter distances and even near macro. In dull light it lacks contrast so avoid that. I bought it second hand for 100 Euros and I couldn’t have spend them better (on a lens). The build quality is absolutely decent and it balances great with my camera (D7100). Take it with you to the zoo and you’ll be amazed by the great animal portraits it delivers but also portraits of humans. Because it has no VR it comes down to your skills so practice is necessary but it will reward you.